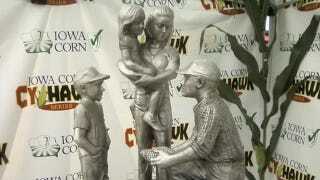 This is the new Cy-Hawk Trophy, given annually to the winner of the Iowa State-Iowa football game. It depicts an Iowa farmer presenting to his family some of the subsidy-fattened corn crop that he will soon sell to an Archer Daniels Midland processing plant in Keokuk, whereupon the corn will be converted into high-fructose corn syrup and ethanol that will make America both fat and asthmatic. The farmer's wife dropped out of the workforce to raise her children, and plummeting land values have vaporized the family's main source of collateral, making it impossible to borrow. The daughter will reject her Methodist upbringing and become a heroin addict at 15. The son is gay. "Just as the trophy reads, we are honest, hard-working, family and community orientated people," CEO for Iowa Corn Craig Floss said. The trophy shows a family talking after a long day of work. "The scene of a family talking after a day's work is representative of our state," ISU athletic director Jamie Pollard said. Thanks for your continued support of Deadspin. Hickey and Dickey are here this weekend.